This post courtesy of Matt, the Beer Baron. 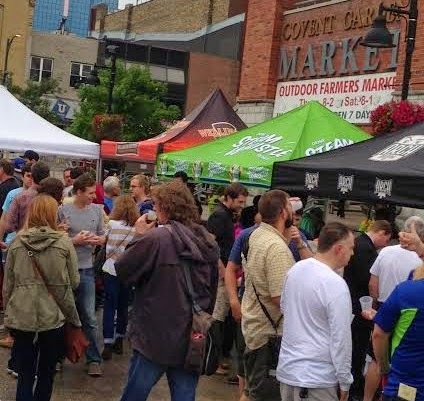 London’s Forest City Beer Fest was held on Saturday, August 10th and despite intermittent showers, there was a great turnout. Now in its third year – and first being held at the Covent Garden Market downtown – the Beer Fest was organized by Aaron Brown, who pulled together a great day of craft beers, food trucks, beer seminars, cooking classes and local vendors. “Once upon a time, I worked with Peter Fowler, and English brewer located near Oxford. The brewery was called Pitstop and all of the beers had an automotive theme. My favourite beer we brewed was called On The Button, named after driver Jenson Button who raced for the Williams F1 team located just down the street from the brewery. The Clockwatching Tart herself joined me, which meant we were also on the hunt for cider – and the festival didn’t disappoint. Angry Orchard, which is owned by the Boston Beer Company of Samuel Adams fame, was in attendance promoting their Crisp Apple cider, which is starting to pop up in LCBOs here. While it was nice to see Angry Orchard, the star of the cider show was Twin Pines, whose cider house is in Thedford, Ontario. We’ve loved Twin Pines since first trying their cider at the London Wine & Food Show years ago. Their cider – actually, their award-winning cider – is fantastic and also starting to be available at Milos’ Craft Beer Emporium, which is wonderful news for us. That said, it was the Forest City Beer Fest, so onto the hoppy stuff! I’m proud to say I hit every single booth at the Beer Fest and one of the more pleasant surprises for me was Block Three Brewing from St. Jacobs, Ontario. Their flagship beer, King Street Saison, is a Belgian-style saison with notes of citrus and spice and was perfect for an afternoon outside. One of the wonderful things about craft beer festivals is getting to meet the brewers and brewery representatives, who are always friendly, knowledgeable and passionate about craft beer (and often beards, too). And Collective Arts brought their citrus-infused Saint of Circumstance blonde ale. Sadly, not all the brewers or brewery reps had beards – but they made up for it by bringing some pretty darn good craft beers to London. Speaking of nice people, Black Oak Brewing Co. was well represented and also came packing their 10 Bitter Years Imperial IPA, which is one of the best beers in the province. While Black Oak has been around for a long time now, the growth of craft beer in Ontario also means checking out new breweries at the festivals, which is always fun. Relatively new to the scene is Arch Brewing Co., which was showing off its Dinner Jacket O’Red IPA and snappy duds. The Dinner Jacket was another nice surprise, with a nice caramel malt backbone. Another newcomer to the craft beer scene is Descendants Beer & Beverage Co., whose logo was drawing raves from the crowd when I was at their booth. Their Harbinger American Pale Ale was nicely balanced. One of the busiest booths seemed to be that of Nickel Brook Brewing, partly because they were taking the time to talk to craft beer fans and partly because they brought quite a selection of beers, including their Equilibrium Extra Special Bitter and their La Paysan Saison farmhouse ale, which was lovely. And to Spearhead Brewing for their Moroccan Brown Ale and Sam Roberts Band Session Ale collaboration brew, which added a bit of a rock-and-roll vibe to the festival. Finally, that brings us to the two beers that really made the festival for me, one I’d had many times but never get tired of and the other a new experience for me. First off, the old favourite, F&M Brewery’s Stone Hammer Oatmeal Coffee Stout, which won the gold medal for stouts at the 2014 Ontario Brewing Awards for good reason. Tying the Stone Hammer stout for my own personal best-in-show beer was the Oblivion American Stout from London’s own Forked River Brewing. Sadly, I didn’t get a photo of the 6.2% Oblivion, but it had the dark brown head I consider a telltale sign that I’m about to taste a wonderful, deep stout and I wasn’t disappointed. BEER BONUS! There was more to the Forest City Beer Fest than just beer. The London Brewing Co-Operative was on the scene, too. While they couldn’t sell beer at the show, they made do with organic watermelon soda and will be selling their first beer soon at The Root Cellar cafe. Event organizer Aaron Brown also happens to be a Brew Sherpa, an online beer appreciation group that I’ve been happily part of for some time now. Whenever there is a special beer event in the city, the Sherpas come out in full force and the Forest City Beer Fest was no different. That’s fellow Brew Sherpa Sarah McCoy Scott in her full beer festival regalia. A special thanks to organizer Aaron Brown as well as all the brewers, vendors, security staff and volunteers who made it such a great day. Cheers!